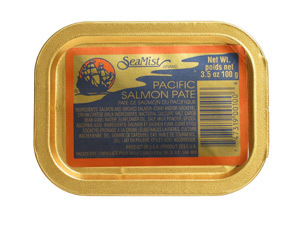 The finest salmon from the cold waters of the North Pacific is used to create this delicious and versatile spread. Salmon contain large amounts of Omega 3 Fatty Acids. These are the fantastic cholesterol lowering fats that are found in abundance in Pacific Salmon. Today you can find Salmon Oil pills in your natural foods store but with our spreads the salmon oil is built right in naturally. All of our spreads are blended with Cream Cheese and spices before they are heat processed to a temperature of 246 degrees F. Our process allows for a very delicate product that can be spread onto the most delicate of crackers. Salmon Spread was our original spread and is still the most popular of all our spreads. Quick and easy preparation means simply open the package and place the spread on a serving platter. This terrific snack or appetizer can be served with sweet red onions and capers on crackers or bread. The product is shelf stable until opened and then keep refrigerated to enjoy over the next couple of days. The easy open lid and lightweight packaging make Salmon Spread a great choice for travelers or for shipping the perfect gift to someone special.